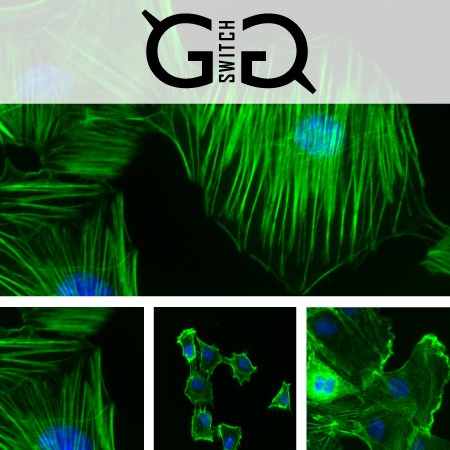 The G-switch™ line of small G-protein tools are highly potent reagents that target endogenous Rho family proteins and pathways. In contrast to methods that rely on over-expression or knockdown of target proteins (e.g., DNA transfection of dominant-negative or constitutively-active Rho mutants, RNAi knockdown), G-switch™ reagents act rapidly on the endogenous target protein (in minutes to hours), thereby optimizing the chance of generating a more physiologically relevant response. Cytoskeleton's products have been cited hundreds of times over the past 18 years. Please contact Cytoskeleton's Technical Support at tservice@cytoskeleton.com for the latest citations. Aguilar et al., 2011. Phos-Tag-Based Analysis of Myosin Regulatory Light Chain Phosphorylation in Human Uterine Myocytes. PLoS ONE. 6, e20903. Anderson et al. 2011. The L6 domain tetraspanin Tm4sf4 regulates endocrine pancreas differentiation and directed cell migration. Development. 138, 3213-3224. Iyer et al., 2012. Connective tissue growth factor-mediated upregulation of neuromedin-U expression in trabecular meshwork cells and its role in homeostasis of aqueous humor outflow. Invest. Ophthalmol. Vis. Sci. doi: 10.1167/iovs.12-9681. Kuang et al., 2012. Rare, nonsynonymous variant in the smooth muscle-specific isoform of myosin heavy chain, MYH11, R247C, alters force generation in the aorta and phenotype of smooth muscle cells. Circ. Res . v 110, pp 1411-1422. Rom S., et al. 2013. Selective activation of cannabinoid receptor 2 in leukocytes suppresses their engagement of the brain endothelium and protects the blood–brain barrier. Am. J. Pathol. doi:10.1016/j.ajpath.2013.07.033. Rom S., et al. 2012. Glycogen synthase kinase 3b inhibition prevents monocyte migration across brain endothelial cells via Rac1-GTPase suppression and down-regulation of active integrin conformation. Am. J. Pathol. 181:1414–1425. Question 1: Which small G-protein activators are best for neuronal tissue or cells? Answer 1: Cytoskeleton offers a variety of GTPase activators that are a part of our G-switch™ line of small G-protein tools that work well for many different types of cells and tissue. We have a Rho activator (Cat. # CN01; calpeptin) that indirectly activates RhoA, B and C in a variety of cell types via a mechanism involving inhibition of Shp-2 phosphatase. Inhibition of Shp-2 allows constitutive activation of Rho GEFs. Calpeptin also inhibits calpain-1 in a mechanism that is unrelated to Rho activation. We also have a Rac/Cdc42 activator (Cat. # CN02; EGF) that indirectly activates Rac1, Rac2, Rac3 and Cdc42 proteins in a variety of cells through activation of the epidermal growth factor receptor-mediated signaling cascade. Recently, we have expanded the G-switch™ line to include activators that directly act on Rho specifically or on Rho/Rac/Cdc42 proteins together (Cat. # CN03 and CN04, respectively). The active site of these direct activators is based on the catalytic domain of the bacterial cytotoxic necrotizing factor (CNF) toxins. For the specific Rho activator (Cat. # CN03), the catalytic domain is covalently attached to a proprietary cell penetrating moiety. CN03 activates Rho GTPase isoforms by deamidating glutamine-63, which is located in the Switch II region of these GTPases. This modification converts glutamine-63 to glutamate, which blocks intrinsic and GAP-stimulated GTPase activity, resulting in constitutively active Rho. For the Rho/Rac/Cdc42 direct activator (Cat. # CN04), the catalytic domain is also covalently attached to the same cell penetrating moiety. CN04 directly activates Rho GTPase isoforms by deamidating glutamine-63 of Rho and glutamine-61 of Rac and Cdc42 in their respective Switch II regions. This modification converts glutamine-63 to glutamate, which blocks intrinsic and GAP-stimulated GTPase activity, resulting in constitutively active endogenous Rho, Rac and Cdc42. Question 2: Why are the CNF-based activators a better choice? Answer 2: The GTPase activators that are based on the catalytic domain of the bacterial cytotoxic necrotizing factor (CNF) toxins are the best choice for activating small G-proteins for multiple reasons. In contrast to methods that rely on over-expression or knockdown of target proteins (e.g., DNA transfection of dominant negative or constitutively active Rho mutants, RNAi knockdown) , the G-switch™ reagents act rapidly on the endogenous target protein (<3 hours), thereby optimizing the chance of generating a more physiologically relevant response. In addition, because they act directly on the target proteins, non-specific activation of other pathways is avoided. The activated state of GTPases is maintained for hours, providing an ample experimental window for studying GTPase activation or inhibition of the activated protein.